It’s not unusual for the paper to be forced to black out parts of its articles retroactively. Celebrities often take legal action against stories about them. What’s extraordinary in this case is that a whole verbatim report of an interview has been redacted. And for once it’s not about some local German starlet, but a Hollywood celebrity: Sandra Bullock. Sandra Bullock is supposed to have told „Freizeitwoche“ all that and more four months ago. 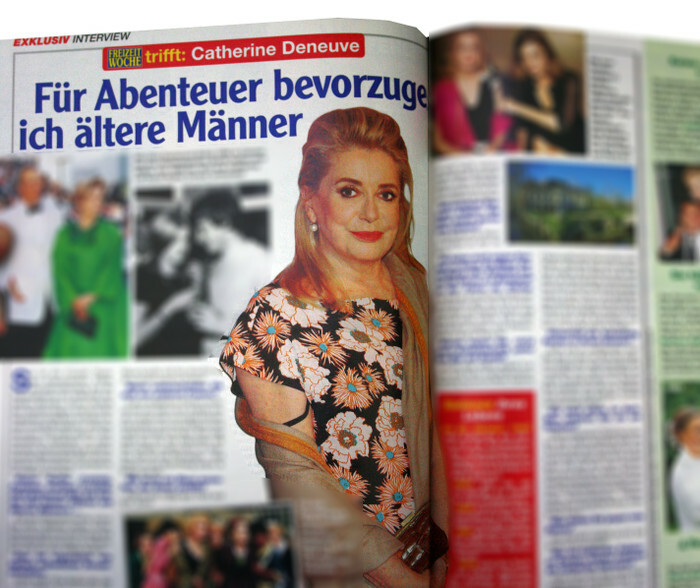 „Freizeitwoche“ has one of the biggest circulations of women’s magazines in Germany. It sells 400.000 copies every week and is published by the companies Bauer and Klambt. In the interview Bullock also talks about her children, her wedding plans and what „turns her on“ in a man. Here’s the catch: „This interview has never taken place“, says Bullock’s lawyer, Nina Lüssmann of the Hamburg chambers of Prinz Neidhardt Engelschall, to Übermedien.de. The lawyer has obtained a provisional injunction against the magazine, which is why it had to black out the interview in its e-paper. 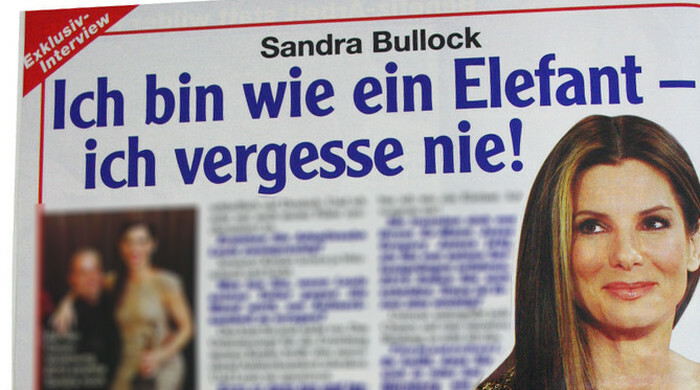 It wasn’t the first interview Sandra Bullock hasn’t given to „Freizeitwoche“. Here’s something that always breaks my heart: In front of me at the till a little old lady painstakingly picks out the coins in her purse. The loneliness in this poor woman’s situation sends a shiver up my spine. I like eroticism, I think it’s important in life. When I have a boyfriend and am happily in love, I flourish. It’s then that I am deeply aware of my femininity. But when I live on my own, like I do at the moment, I can let my sexual urges die down completely, channel my sexual energy into creativity. But, as lawyer Lüssmann says: „None of these interviews have taken place, either.“ At Bullock’s request she’s taken legal action against four of them (the 2005 case falls under the statue of limitations). George Clooney, Leonardo DiCaprio, Tom Hanks, Johnny Depp, Julia Roberts, Robert De Niro, Matt Damon, Harrison Ford, Tom Cruise, Meryl Streep, Celine Dion, Sylvester Stallone, Bruce Willis, Al Pacino, Morgan Freeman, Nicole Kidman, Jennifer Aniston, Mel Gibson, Scarlett Johansson, Jim Carrey, Robert Redford, Angelina Jolie, Michael Douglas, Clint Eastwood, Kevin Costner, Dustin Hoffman, John Travolta, Jodie Foster, Ben Affleck, Jack Nicholson, Russell Crowe, Keira Knightley, Nicolas Cage, Matthew McConaughey, Pierce Brosnan, Kate Winslet, Richard Gere, Jennifer Lawrence, Susan Sarandon, Helen Mirren, Hugh Grant, Cameron Diaz, Brad Pitt. The paper claims to have met more than 150 Hollywood celebrities and world-famous musicians for exclusive interviews – most of them even two, three, four, five or six times. 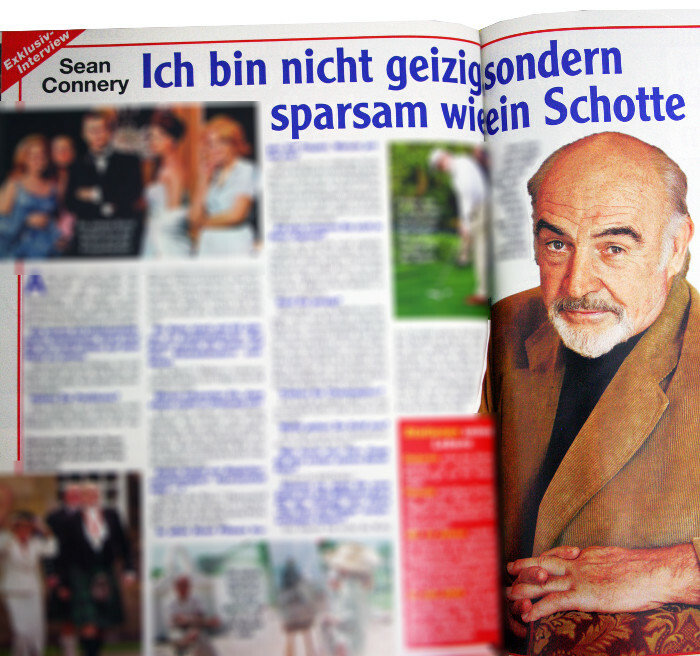 In the last twelve years „Freizeitwoche“ published more than 300 interviews with international superstars. Other media outlets spend years trying to get just one celebrity of this calibre for an exclusive interview. It’s not just the sheer size of the output that is incredible, but also the content: the stars seem to be willing to share their most intimate secrets with „Freizeitwoche“ – or with the journalists whose interviews it acquires. As in the alleged interviews with Sandra Bullock, the other celebrities seem to talk without inhibition about their private lives. They talk revealingly about their relationships, their families, their dreams, fears and sexual preferences; they talk about alcohol addiction, miscarriages, suicide attempts and cosmetic surgery. Sometimes, they also lash out against colleagues or admit to adultery. We’ve translated a couple of interviews, sent them to the interviewees‘ agents and asked whether or not the conversations actually took place. 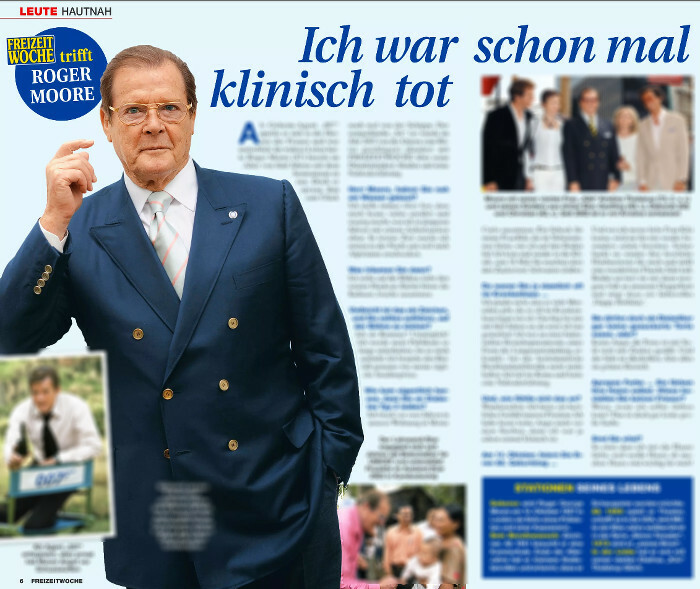 The likeable ‚Sir‘ (he was knighted by the Queen in 2003) chats with ‚Freizeitwoche‘ about his over-sensitivity, his sins, and his near-death experience. 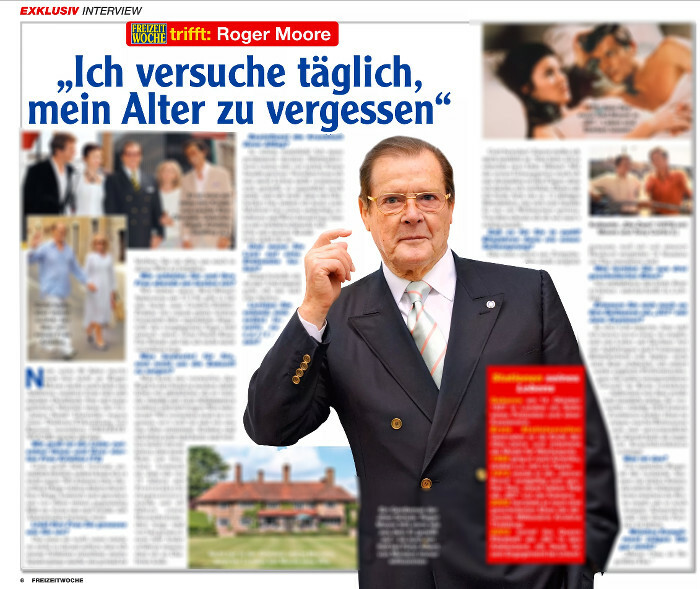 „This was not an interview with which Sir Roger was involved“, his spokesperson says. 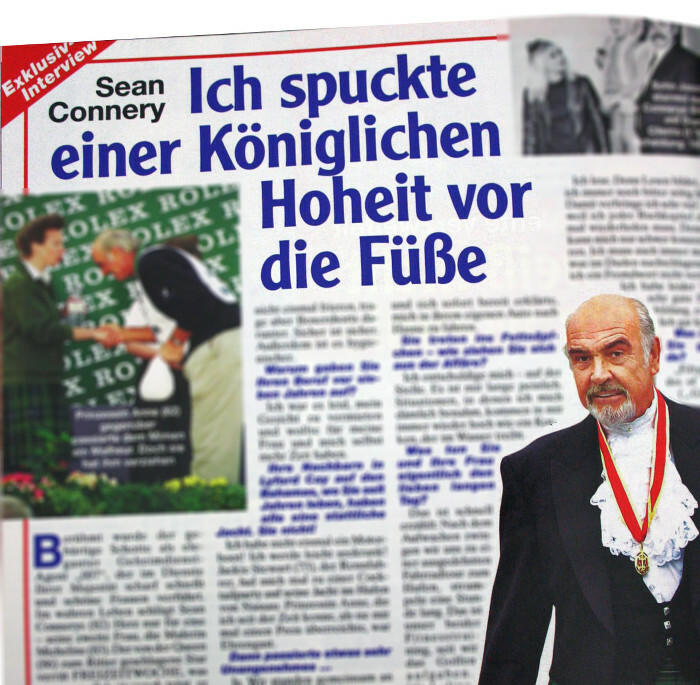 The star, knighted by the Queen, reveals to ‚Freizeitwoche‘ what he wears under his kilt; he talks about his complexes, his most embarrassing mishap, losing his virginity and about crying. „Sir Sean is retired and hasn’t been speaking to media at all so I can’t imagine that he gave these interviews“, says a spokesperson from his agency. She was and still is a world celebrity. Catherine Deneuve has celebrated many successes as an actress. But as a mother she failed miserably, the 69 year old admits to „Freizeitwoche“. 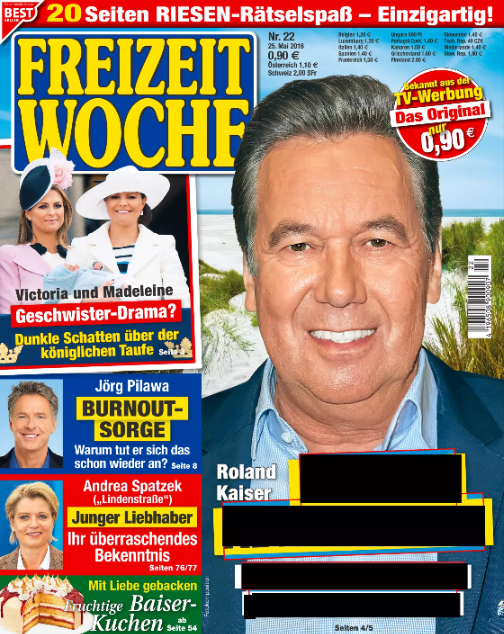 Has „Freizeitwoche“ been publishing manufactured interviews for years? The magazine gets interviews from „experienced correspondents“ abroad, he says, and from „freelancers with whom we’ve been working faithfully for years“. Right now there was just the one instance, he says, „one interviewee, with whom one of our freelancers has spoken, where we need to resolve things legally“. Since the investigation was still going on, he could not tell us about results. He would not reveal to us who the interviewers were, and when the interviews are supposed to have taken place.